Welcome to this beautiful mountain cabin with its own hot tub and a spring creek to the side of the house, this will make it the relaxing getaway you desire. 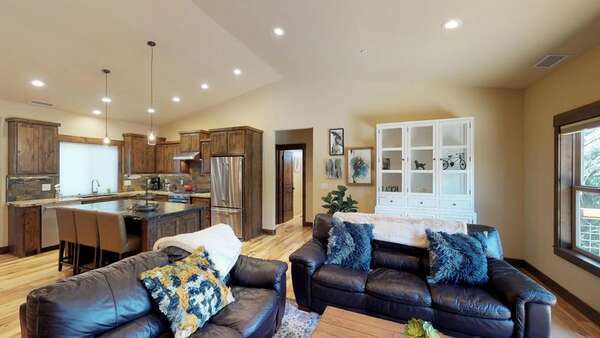 On the main floor, you'll be welcomed by an open concept living room, with high vaulted ceilings, a wood stove, for those cold winter nights, and a nice size deck, with the hot tub, seating in the summer, and the BBQ. Cook a delicious meal in the kitchen while the family enjoys a game or a movie. The same floor has a full bathroom and 2 other bedrooms. Feeling the need of some privacy, walk upstairs to the master suite with its own bathroom and a loft, snuggle up on the couch with your favorite book or watch the TV while relaxing in your own quarters. This house was set-up with your family in mind, there is a family room on the first floor, with a big couch, TV and extra sleeping so your kids get their own sanctuary. Our Mountain View Tahoe Donner Family Cabin is a great property to spend your summer as well as your winter vacations, Tahoe Donner Association gives you access to the clubhouse that has 2 swimming pools (a heated lap pool open year round and a big pool open in summer only), 3 hot tubs, 2 saunas, a cardio and a weight room. There is also a golf course and tennis courts only a few minutes drive from the house as well as a private association beach on the east end of Donner Lake. Tahoe Donner has a ski resort as well that's available for your enjoyment, especially great if you have children. You won't even need to leave the area because of all the great activities offered including 2 restaurants, hiking, and biking trails just as you walk out your front door, enjoy our private vacation home as much as we do. Winter Activities are: Downhill Skiing, Cross Country Skiing, and Snowshoeing, Tubing and sledding.